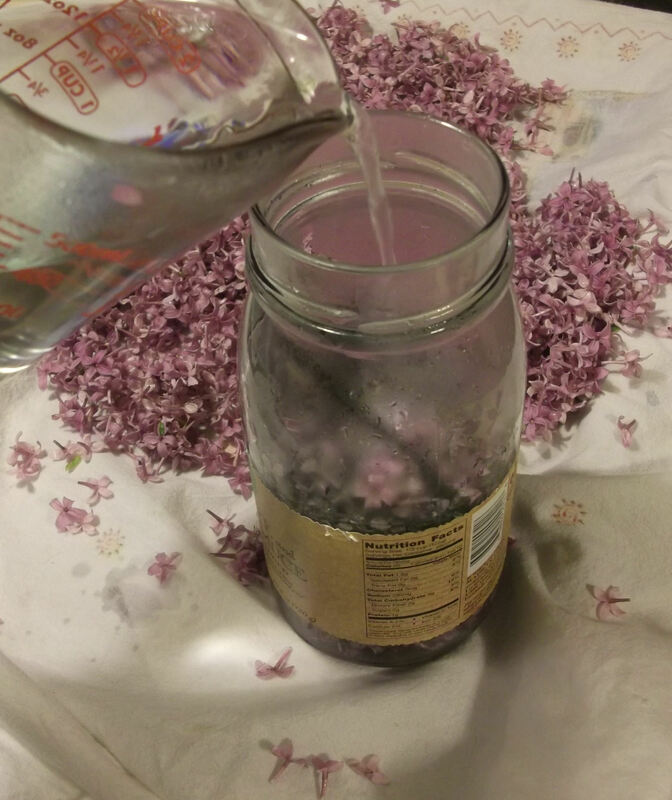 The night before, make this lilac infusion: tightly pack two cups of lilac blossoms and stuff them into a thick jar (at least 24 oz). Pour the boiling water over the lilacs. Optional: slice a vanilla bean in half lengthwise and add that to the jar. Cover and let sit overnight. The next day, pour the infusion through a strainer directly into a medium saucepan. (Reserve the vanilla bean pod for other uses.) You’ll have about 2¼ cups of liquid; add more water if needed. Slice the lemon in half lengthwise and squeeze the juice, also through the strainer, into the saucepan. Add the pectin to the saucepan and stir. Bring the mixture to a rolling boil, stirring constantly. Sterilize the jars by placing them in a separate pot, covering them with water, and bringing the water to a boil. Keep the jars warm/hot until just before using so they won’t crack when the hot jelly is poured in. When the mixture reaches a rolling boil, add all of the sugar at once and stir to dissolve. Return to a rolling boil for one minute, stirring. Remove from heat and quickly skim off as much of the foam as possible. Pour or ladle the jelly into the hot, sterilized jars. Wipe off the rims and grooves of the jars, place the caps on, and screw down the lids just until tight. Process in a water bath according to the directions on the pectin box. Start the process the night before, and make the lilac infusion. The lilacs will immediately fade when the boiling water is added. That’s okay. Stir things around a bit to distribute the blossoms, which will also make a little more room in the jar if needed. The next day, pour the infusion directly into a medium saucepan through a strainer. (Reserve the vanilla bean pod for other uses.) Press against the strainer with a spatula to coax more liquid out. Slice the lemon in half lengthwise – you get more juice this way than if you cut it in half across the middle. Squeeze the juice, also through the strainer, into the infusion. Add the Sure-Jell pectin to the saucepan, stir, and bring to a rolling boil. Measure out all of the sugar into a bowl. 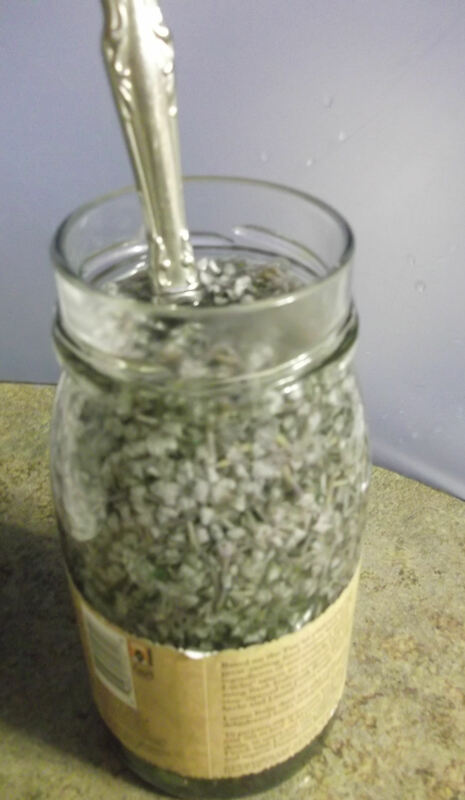 If using lilac sugar for any or all of the sugar (I used a little of each) you can either sift it through a large-mesh sieve to separate the blossoms from the sugar or just use the lilac sugar, blossoms and all, and strain as you fill the jars. Or just leave them in. They won’t hurt anything. When the mixture reaches a rolling boil, dump in all the sugar at once and stir to dissolve. Return to a rolling boil for one minute, stirring constantly. Remove from heat, and quickly skim as much of the foam off the top as possible with a spoon. Pour or ladle the jelly into the hot, sterilized jars. The jelly can be used immediately. Try some with lilac muffins. Enjoy! Thank you so much! I am so surprised how my batch turned out! First Try! I love it when folks like you are so clear on instructions! I have passed along a link to your Recipe on my Ozarks Nature Facebook group! Thank you for the very clear instructions…i did happen to notice that other recipes have yellow, clear jelly but your jelly is pink and cloudy. I have never made jelly before so i am trying to figure out what recipe i want to try. I made lilac cookies, simple syrup and may end up just doing the lilac honey with the rest. I also have a small batch of lilacs infusing in some jojoba oil. Not sure how that’s going to turn out but the cookies and simple syrup turned out fantastic. Love that the lilac syrup worked out! I’ve been making a ton of syrup with my bumper crop of mint as well. I think I need to make my lilac jelly again and get better, more accurate photos. The time I made it for the blog I’d mistakenly used a really weird version of pectin that clouded the jelly, even though it still tasted great. I suspect the “correct” version should give you clear, pink jelly. Let me know if you give it a try! I made the jelly again, this time with the correct pectin, and my results were great! I’ve updated the photos to show a clear, yellow jelly. I hope you’ll give it a try! These turned out great, I was very skeptical about the whole thing and have never jellied anything floral. I will be making more this week we loved it so much!!! How far do you fill the jars?? Glad you loved it! I fill my jars just about to the top: the jelly shouldn’t expand as it cools, but maybe leave a centimeter or so of head space at the top, just to be safe.